Originally published in 1928, this volume gathers together seven essays on various aspects of the Old Testament. Through the rigorous textual analysis of hints and statements scattered over its several books, a composite picture of the development of the religion of Israel is developed. This reconstructive historical analysis is also informed by a refined knowledge of contemporary theological developments, and a list of the key authors consulted is provided at the end of the text. Additional material includes a detailed index of scriptural passages quoted or referred to. This book will be of value to anyone with an interest in theology and religious history. 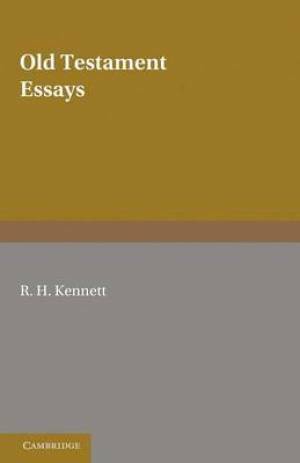 Old Testament Essays by R.H. Kennett was published by Cambridge University Press in January 2012 and is our 64958th best seller. The ISBN for Old Testament Essays is 9781107663985. Be the first to review Old Testament Essays! Got a question? No problem! Just click here to ask us about Old Testament Essays.